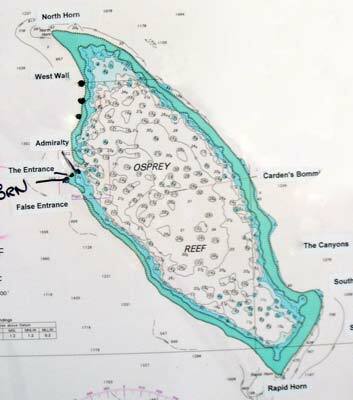 This dive site is located about half way between the northern most point and western most point of Osprey Reef. 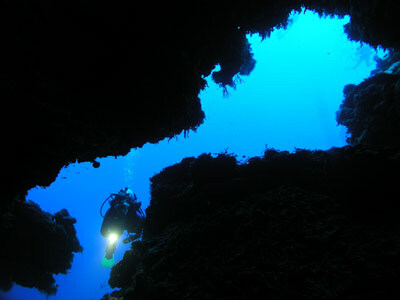 The reef loops in a concave shape from these two points and the dive site is approximately the eastern most point of this section of the reef. 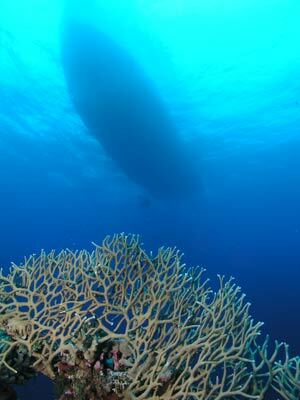 The mooring is located on a bommie at about 15 metres. The GPS Reading for the mooring is S13° 50' 56.5" E146° 33' 50.6" using WGS84 as datum. It is approximately 315 kilometres from Port Douglas. The reef here is composed not of one complete section of reef, but many huge bommies. These give the name to the dive site as some of them do look like the traditional "castle". In between the "castles" there are gullies and canyons. Some are narrow and form tunnels and others are quite wide and deep. 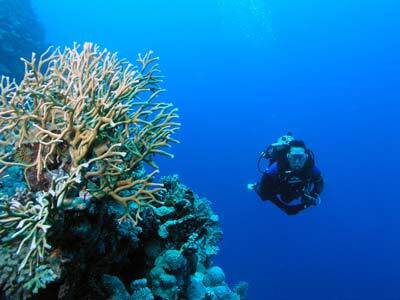 When you enter the water, drop to the reef side and head to the south. There is unlikely to be a current, but if there is, it will be coming from this direction. As you head south, go to about 30 to 32 metres. There are some large (proper) caves here and if you go inside, you will get some nice photos if your buddy stays outside in front of the cave's entrance. See the ones below. You can go a fair way before you need to turn around. Come up a bit as you go, staying out of decompression. You will see more caves and tunnels and lots of canyons between the bommies. You can go up some of the canyons and at the end of a couple you will find a large sand area. This is worth exploring. Come back to the main reef via one of the canyons. you could also go over the reef at the side of the sand area (if there is no suitable canyon) and then come back to the main reef. Once you decide to turn around, come back a fair bit shallower (say 20 metres). This will enable you to explore more of the cnayons. Once back at the mooring area, go around each of the main bommies. The one to the north of the mooring has a tunnel from north to south. This is easy to swim through and provides good photo opportunities. There are said to be more tunnels and swim-throughs in the base of other bommies, especially the one to the north-east, but I could not find any of them. The sand in between some of the bommies have garden eels and there are also some white-tipped reef sharks here as well. 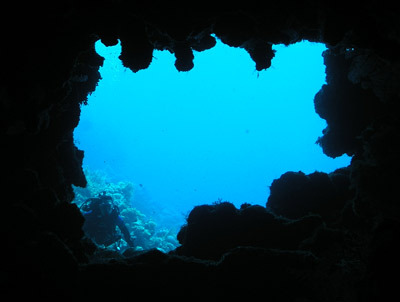 When you need to leave the bottom, come up around a bommie, examing all the nooks and crannies. There are some very nice soft and hard corals on these bommies and lots of fishlife. Again, the visibility is excellent here, at least 40 metres. Water temperature was about 26C in November. This is also an excellent night dive. 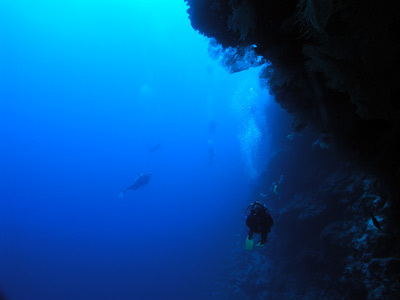 A similar dive to the one described above should be done but do not go past about 20 to 22 metres. You can see flashlight fish in caves, overhangs and canyons. 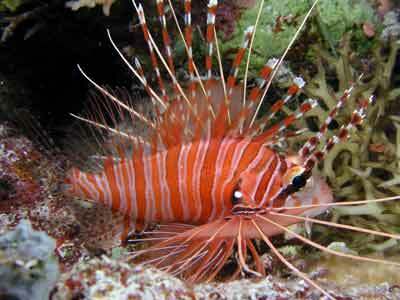 You can also see many firefish, one or two sleeping turtles and lots of shrimp and small crabs. One of the best night dives I have ever done.